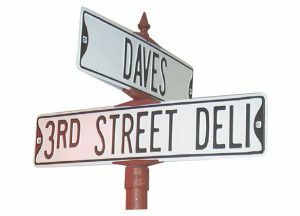 Dave’s 3rd Deli has seating for 72. Eat in, or dine out! Our Team is ready to serve you. Try our famous homestyle fried chicken, a signature sub sandwich, a brick oven crust pizza, or choose from any of the many homemade daily specials. You’ll find economical meals that are quick when time is tight. Just passing through? Ice cream cones are just 50¢ everyday, all-day. And the coffee? Well, its brewed fresh daily and always on the house! So stop by and enjoy good food & good fellowship with family and friends.